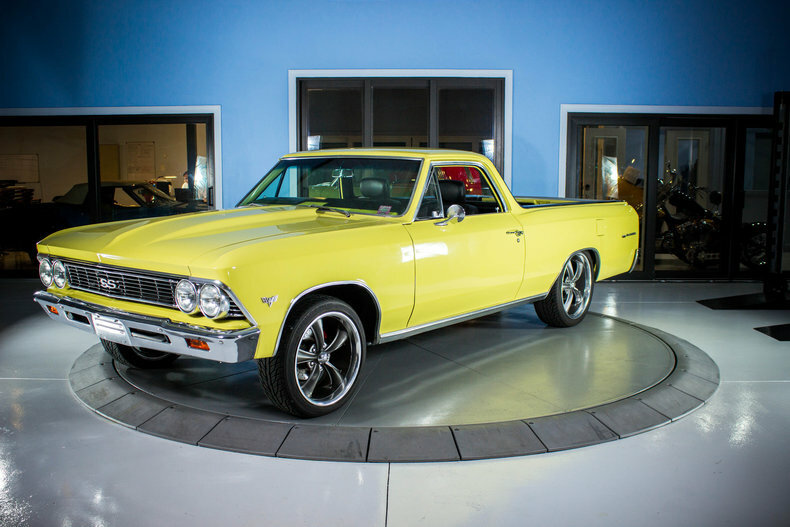 The Chevrolet El Camino is a coupé utility/pickup vehicle that was produced by Chevrolet between 1959–60 and 1964–1987. Introduced in the 1959 model year in response to the success of the Ford Ranchero pickup, its first run lasted only two years. Production resumed for the 1964–1977 model years based on the Chevelle platform, and continued for the 1978–1987 model years based on the GM G-body platform. Although based on corresponding Chevrolet car lines, the vehicle is classified and titled in North America as a truck. The 1965 327 would run low 15s in the 1/4 mile at 90 mph), while 1966 to 1969 models were easily into the mid- to upper-14s. In 1966, GM added a 396 cu in V8 engine to the lineup rated from 325 to 375 hp. The 1965 327 would run low 15s in the 1/4 mile at 90 mph), while 1966 to 1969 models were easily into the mid- to upper-14s. New sheetmetal highlighted the 1966 El Camino, identical to the Chevelle. A new instrument panel with horizontal sweep speedometer was featured. Inside, the standard version featured a bench seat interior and rubber floor mat from the low-line Chevelle 300 series, while the Custom used a more upscale interior from the Chevelle Malibu with plusher cloth-and-vinyl or all-vinyl bench seats and deep twist carpeting, or optional Strato swivel bucket seats with console. A tachometer was optional. A 1966 El Camino 396 big block engine was now available as well. 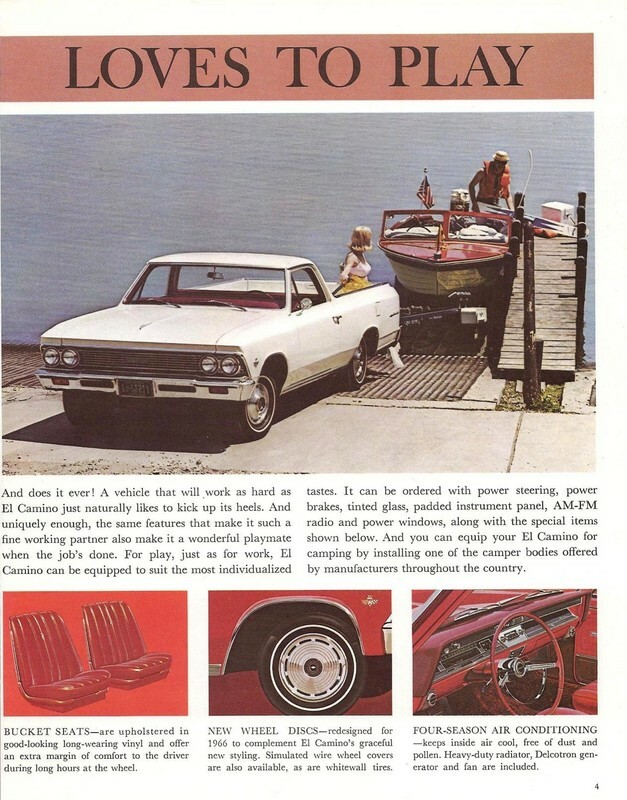 Although the 396 engine was available, there was no official 1966 El Camino Super Sport option. The 1966 El Camino trim was available in two levels including the base model El Camino and the El Camino Custom. The base level El Camino featured more trim than the previous year including a bright tailgate latch, bright windshield molding, and chrome hood molding. 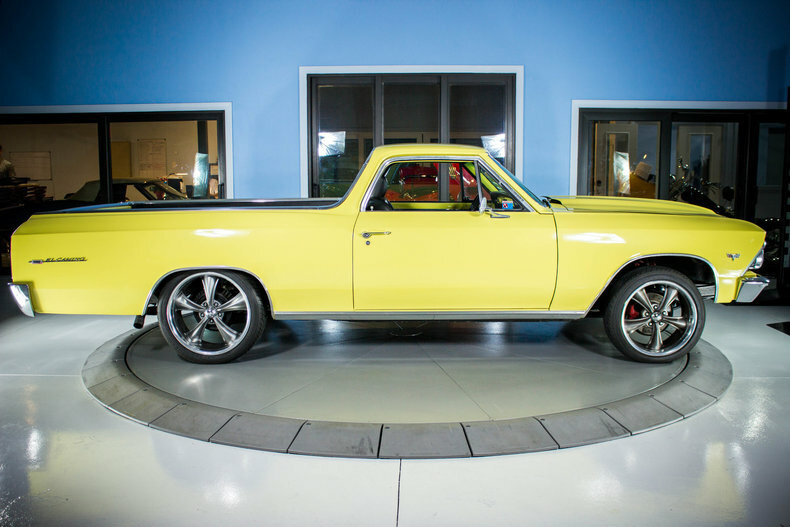 The El Camino Custom featured the same trim pieces as the base model but also included bright body sill moldings, wheel opening moldings, roof drip moldings, windshield pillar moldings, and door frame moldings. Each configuration could be ordered with a six cylinder or V8 engine. Base model El Camino interior colors were available in Fawn, Blue, or Red. El Camino Custom interiors could be had in Black, Fawn, or Red. 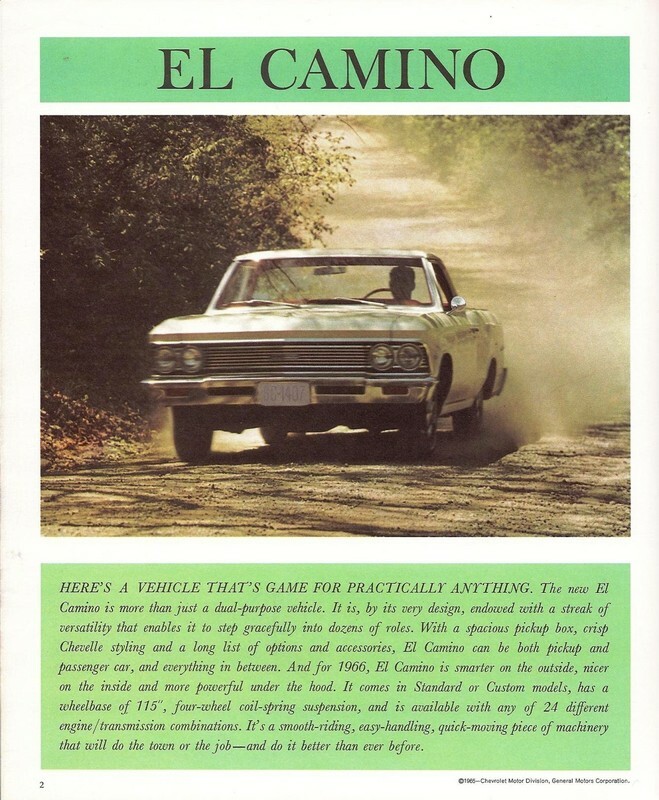 The buyer could have ordered a number of different El Camino exterior colors including Tuxedo Black, Ermine White, Mist Blue Metallic, Danube Blue Metallic, Marina Blue Metallic, Willow Green Metallic, Artesian Turquoise Metallic, Tropic Turquoise Metallic, Aztec Bronze Metallic, Madeira Maroon Metallic, Cameo Beige, Chateau Slate Metallic, and Lemonwood Metallic. 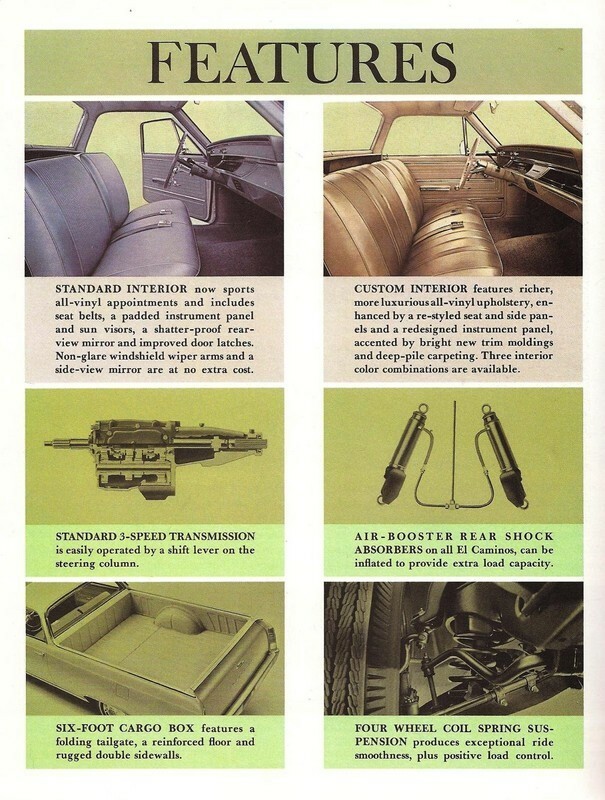 To complement the wide variety of available colors were the available drive train combinations that could be opted for on the 1966 El Camino. Base power was had by one of two six cylinder engines. Buyers who wanted more power could opt for aV-8. Manual transmissions were either 3 speeds or 4 speeds and the only available automatic transmission was the 2 speed Powerglide. 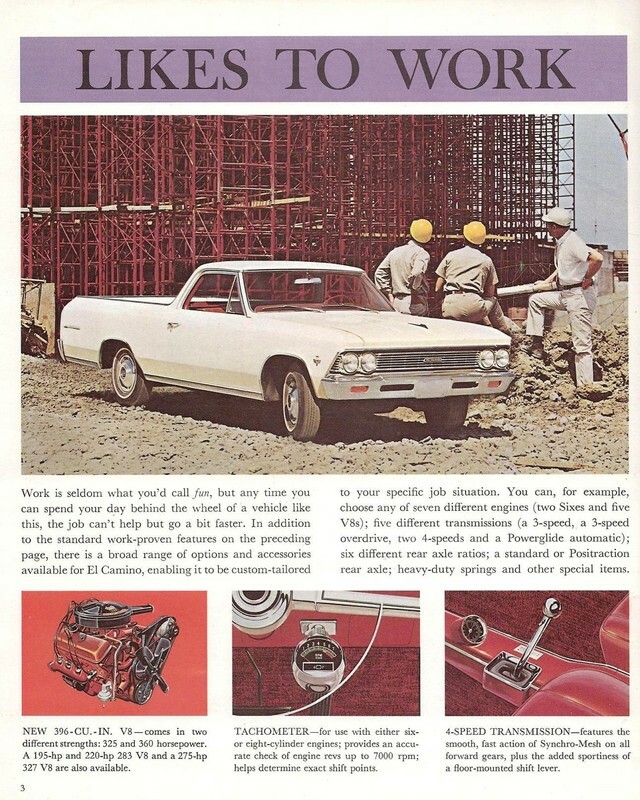 About 35,000 1966 Chevrolet El Caminos were produced. If you have questions, please feel free to call us at 941-254-6608!